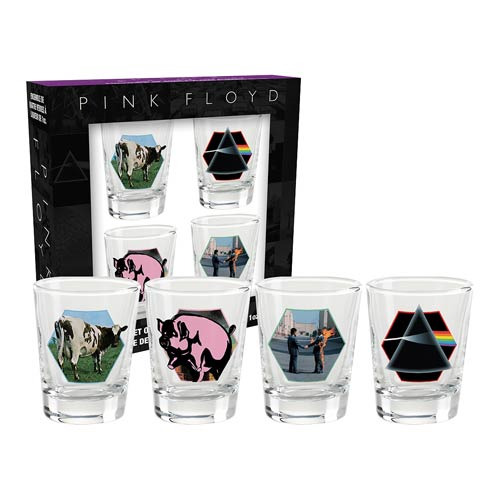 Shopping for Pink Floyd Shot Glasses? Raise a glass to your all-time favorite band! This Pink Floyd Series 1 Shot Glass Set includes 4x shot glasses with cover art from different Pink Floyd albums. So whether you love The Dark Side of the Moon, Wish You Were Here, Atom Heart Mother, or Animals, this makes a great gift for any Pink Floyd fan! Hand wash only. Not dishwasher safe. Shot glasses hold approximately 1-ounce of liquid. Ages 17 and up.